Why you need a portfolio? Because the interviewers will be much more impressed while you will show the collection of works and easy to explain how/what you can do with your project university/college..
"Coroflot is a career and community site for creative professionals - job board for creative folks where the strongest categories are industrial design, interaction design and graphic design.Coroflot is from the folks at core77 which is a blog/community about industrial design stuff"
You can create an account then upload your works in your portfolio account~! It is easy. :) Many companies still looking for the graduate designers so, it can help them to get a career! Before I started to find internship, my tutor and friends told me that try to use Coroflot. I think that why I not try to put my works in my portfolio? I started to find a internship job after I put some into the coroflot..But, suddenly, I got the contact from few companies! :O They said want to find freelancer and full-time job designer! 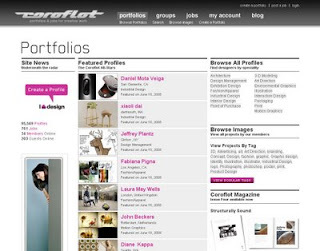 We are glad your portfolio has been such a success on Coroflot! Wow, I really happy about you come to my blog! :D Thank you very much!